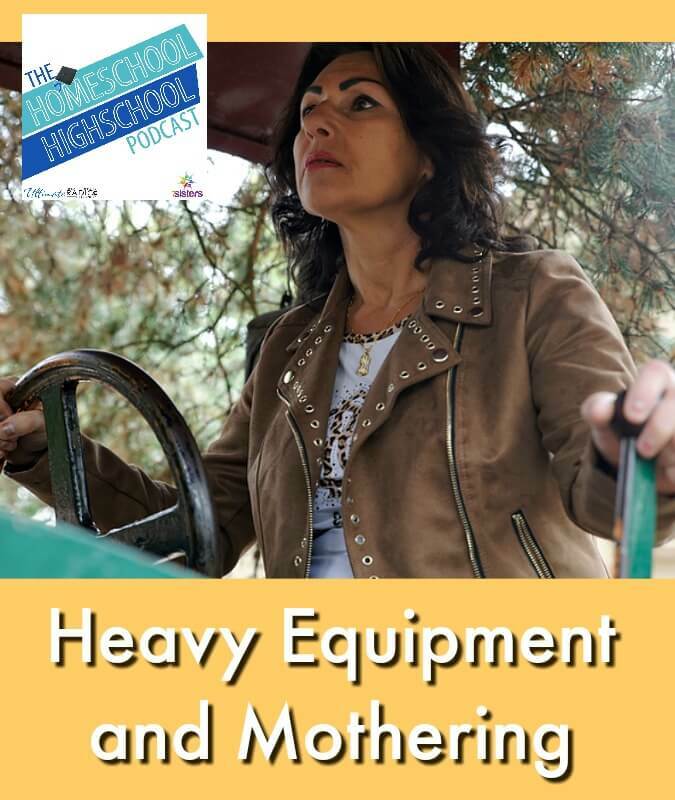 This week on HSHSP Ep 135: Heavy Equipment and Mothering. Helicopter moms, snowplow moms… it is SOOOOO tempting to turn into a heavy equipment mother. Is it good for your homeschool high schoolers to have a mom who swoops and saves, clears out all the paths or smothers her teens? While we’d love to say *YES*! We all know that it just ain’t so. Homeschooling high school means we are preparing to let our teens go into adulthood… in God’s hands, not ours! Join Sabrina, Vicki and Kym as they wrestle through the tough issues of heavy equipment mothering. We moms worry that we aren’t doing good enough jobs with our mothering! In fact, as Vicki says: Motherhood is all about guilt! We want our kids to do well and be equipped for success in life! When they are young, we train our kids about behavior and consequences. So we apply the same concept to parenting. If we are perfect moms our teens will grow up to be perfect. Right? Right? In God’s universe, things don’t work out that way. HE’S in charge of the outcome. Not us. So we moms, when we are trying to be perfect and make life perfect for our kids, we are in danger of trying to be God ourselves. We want our behavior as moms to guarantee perfect outcomes (OUR version of perfect). Snowplow moms that swoop everything hard out of the path of their kids. However, when we clear the path in front of our kids so they have NO bumps or hardships, we actually debilitate them. They do not develop skills for problem solving and stamina! We need to seek Godly wisdom on what to clear out and what when to step back out of the way. We are responsible for being aware of what our kids are ready to handle. The only way to know when to clear the way is to know our teens and know God’s voice. Helicopter moms are the moms who hover, giving kids answers to academics or life, tell sports coaches how to coach, or forgets that their teen’s friends are their teen’s friends. They are living their kids lives instead of allowing their kids to live their lives. We need to be involved in our homeschool high schoolers’ lives. We need to primarily be listeners and questioning guides. We want to pull answers and good thinking OUT of teens. Not hover and do it for them. Bulldozer moms push and push and push to the point that teens are frustrated and exhausted. These are moms who envision the very best life for their homeschool high schoolers so drive their kids into it, creating teens who are anxious and sad or are bulldozers themselves. Remember, teens need SOFT skills, not bulldozing skills. Remember grace and rest. We are not responsible with outcomes! Keep your hope in God, not your own hard work! Join Sabrina, Vicki and Kym for a powerful and gracious discussion about heavy equipment and mothering. Also enjoy this encouraging episode of the Homeschool Sanity Podcast about how to powerfully pray for your family. Also this episode on the good news about *mom-fails*.